With the Easter holidays approaching fast, I'm super busy with 'summer wardrobe' personal shopping for those sunshine get-aways! (Not jealous in the slightest!). So I thought I would share my top 5 holiday items to inspire those lucky enough to be flying off to sunnier climes! Happy shopping and happy holidays! 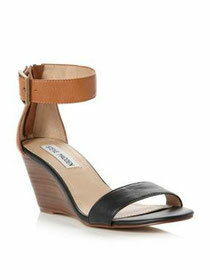 Steve Madden has been my favourite shoe designer since I discovered his store many years ago on a buying trip in LA. Beautiful, modern shoes, clean and simple lines and the best bit is, they are actually affordable! I am, yet again, in love! This is a true 'take you anywhere' dress! 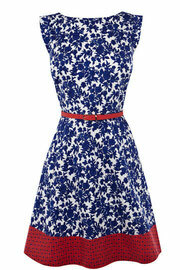 A fab mix of prints, contrasting coral belt to accentuate your waist and a great A-line skirt to flatter any shape. White is a colour synonymous with summer but for SS13 it was bigger than ever on the catwalks. 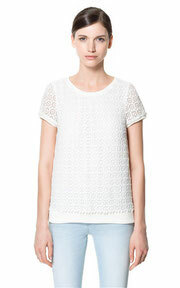 The key to making it fresh is all about texture and this top absolutely nails it - a simple T-shirt design in a beautiful guipure lace and chiffon back detail. And if you're looking for something brighter they do it in coral too! GAP have a fabulously colourful SS13 collection in store that is cheering me up on these rainy shopping days. 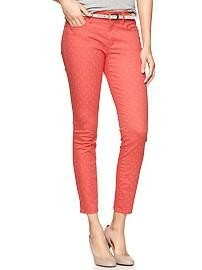 In particular they have a great range of gorgeous bright skinny jeans both plain and printed. This pair are not only in a fab bright coral colour but also have a subtle polka dot print so you'll be rocking the printed jeans trend too! This is a fabulous 'chuck-on' dress which needs no thought at all. In a gorgeous subtle print, waisted fabric belt and flattering open neckline you really can throw it on and go! Perfect for summer days at work and easy to dress up too with a leather skinny belt, stack of bangles and some fab wedges. Have you bought any new bits for summer yet or has the current weather turned you off? Are you one of the lucky ones jetting off this Easter? If so what are you packing? If you need any help with a fabulous new spring summer wardrobe you know where I am!